We just finished a two week climbing trip in Joshua Tree National Park. Several of our climbing days were pretty terrifying. We’re both safe and currently relaxing in Phoenix, Arizona, so all is well. Our efforts paid off. 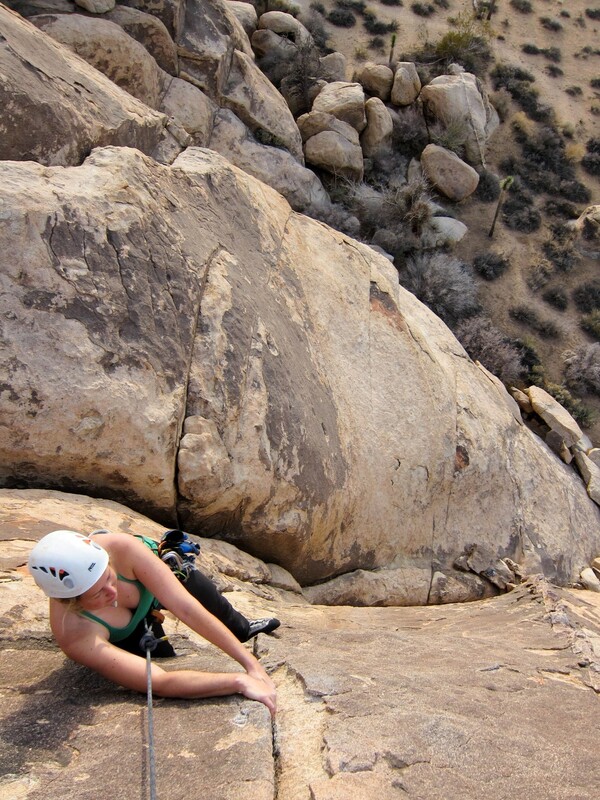 By the end of our time in Joshua Tree we were both climbing some pretty hard routes, which means relying on tiny, 1/2″ edges and perfect balance to make your way up the wall. Fun! The climbing wasn’t the scary part. The scary part was hanging 100 feet up from the ground on a big rock wall for 30 minutes with nothing but two 1″ pieces of webbing holding me to two bolts. I hung there in my climbing harness next to the wall, slowly feeding out rope as Brian climbed Moosedog Tower. This is called a multi-pitch climb, where the total elevation gain is too tall for the rope to reach, so we had to break it up into smaller parts by stopping in the middle, pulling up the rope, and continuing the climb from a belay station 100 feet in the air. On this trip, I watched cams and nuts pop out of cracks. I saw Brian take several scary falls. He didn’t seem to be afraid of anything. I can’t say the same thing for myself. I don’t know what to think of trad gear. These metal things called cams are spring loaded with moving metal lobes. Those moving lobes are supposed to hold the cam in a rock crack while a person falls on them with tremendous force. They worked most of the time, but most of the time doesn’t seem like enough when your life depends on them! There are a lot of subtleties to placing these cams, so taking a class on leading trad climbs seems like a good idea before trusting them on big climbs. We hiked to Hidden Dome to do what we thought was a nice, moderate day. Not so! We hiked a mile across the flat desert surrounded by big, spike-topped Joshua Trees, then found a steep, boulder-choked gully standing between us and our desired climbs. 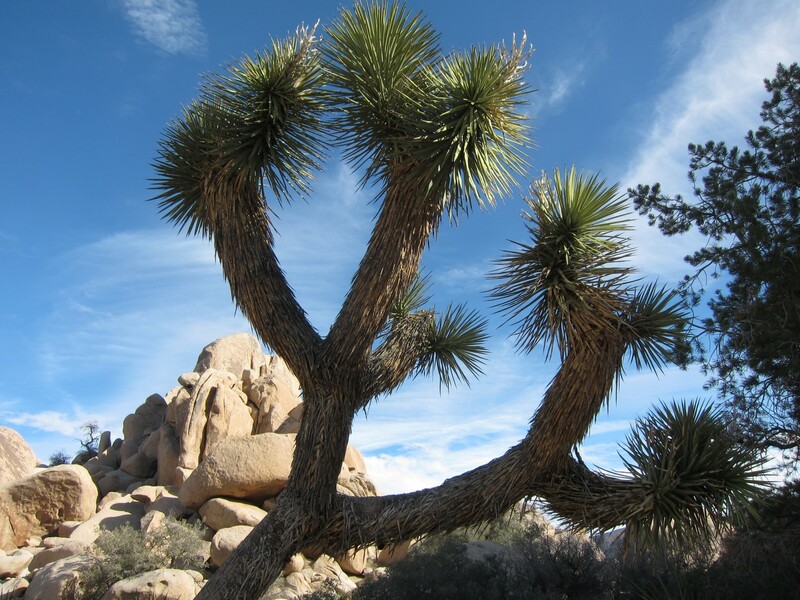 The boulders in the gully were car-sized and house-sized, beautiful granite, with deep, dark chasms of doom between them. Make a mistake, fall 20 feet. This approach lasted over an hour until we got to a tall granite wall on the side of Hidden Dome. We enjoyed some wonderful 5.8 climbs with airy views down to the desert far below, lightly sprinkled with gray, fuzzy bushes. After the climbs, we had to once again face the boulder gully. 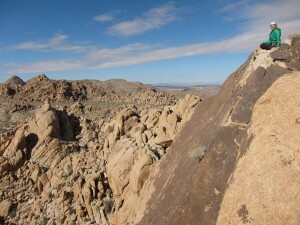 I rejoiced when my feet were finally on solid ground at the end of the descent. 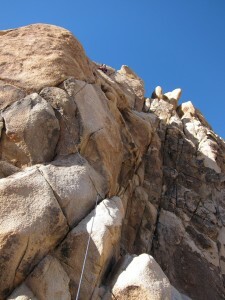 Our next step is to take some classes to prepare for longer multi-pitch climbs in Red Rock Canyon near Las Vegas.